Since golf’s birth in the Scottish Highlands, the fashion begun its journey with the current-at-the-time Scot’s fashion of knickers (or knee breaches as they were more commonly called in England), tweed jackets and waistcoats) which were worn to shield against the woolly weather but hardly designed for a good comfortable swing!). A starchy collared shirt and leather shoes were also worn by golfers. Of course, all the materials were plaid which was an offset of the tartans worn by the Scots during these early days. 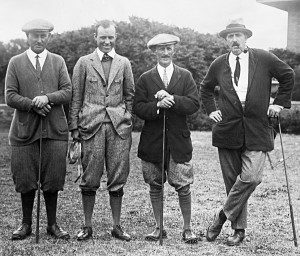 During the 1920’s golf became a distinguished sport, and those who played it were gentlemanly types wearing plus fours (again, like the knee breaches from England), cardigans on the brisker days were added, and two-tone shoes. By the 1930’s trousers had replaced the brea ches / knickers and neck ties were removed. A simple white shirt or shift was in favour, especially as many men went straight from work to the course. The 40s brought on golf fashion that we still see today – short sleeved knit tops, lightweight slacks or shorts (usually khaki or checked) and spiked shoes. For the cooler weather cardigans were still in vogue with their easy to wear and flexibility for arm movement. A blaze of colour followed in the 1950’s with the golf shirt closely following the tennis Lacoste label matched with colourful trousers and shorts. It was here that golf fashion and style may have endured a few jokes and laughs. Added to the 60’s were the types of fabrics brought in to play – namely synthetics like nylon and polyesters. All in browns, oranges and yellows. The caddies dressed liked hippies and the players like someone in Vegas. The 1970’s brought in the beloved turtleneck and lots of hound’s tooth fabric. 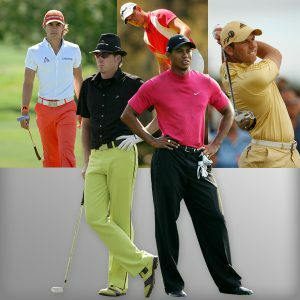 As TV became more popular in household s, golf wear also transcended it’s influence of fashion. The traditional golf fashion returned in the 80’s but with emphasis on the technology of the fabrics – waterproof leathers and shirts, and stretchable fabrics. Golfers stepped into designer labels, including that of Greg Norman who created his own line of golf label called Shark. With sponsorship now a huge part of golf, golf fashion was taken over by branded clothing. As the sport became more popular, the casualisation of the fashion was an opposite trend to the branded logos of the sponsored players. The noughties brought in how technical the clothing could really get – with sun-blocking materials and moisture proofing fabrics with a no ‘sweat zone’. Whatever you wear on the course, golf fashion will likely to ever evolve – swinging like a pendulum, backwards and forwards with the only certainty we know will continue to adapt is the technolisation of the clothing itself.